At Myers Orthodontics, our mission is to make your smile as beautiful and healthy as possible—and to keep it that way for the rest of your life. Dr. Myers and our highly trained team of orthodontic specialists work hard to treat patients on an individual basis, designing specialized treatment plans that perfectly suit each patient's unique orthodontic needs. Braces are by far the most common treatment we offer—but thanks to advances in orthodontic technology, there are many types of this classic treatment. 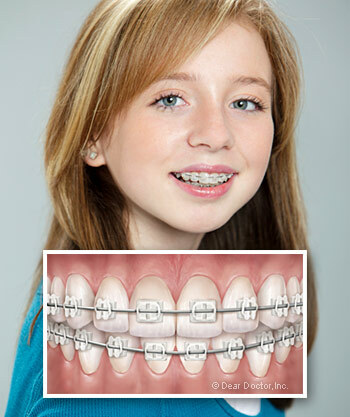 Orthodontic appliances come in two distinct types - fixed and removable. Fixed appliances, such as braces, are attached to the teeth with metal bands and bonded using special dental cement and are generally not removed until treatment is over. Removable appliances, like Invisalign, are worn at least 20 hours per day but can be taken out to eat, drink, brush, and floss. While aligners offer increased flexibility, there are still many cases where fixed appliances offer a more powerful, reliable, and cost-effective solution. 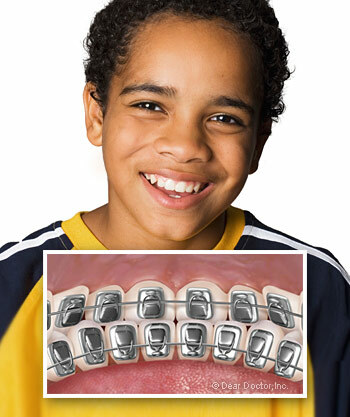 Metal braces are the most common type of orthodontic treatment and probably also the one that you’re most familiar with. 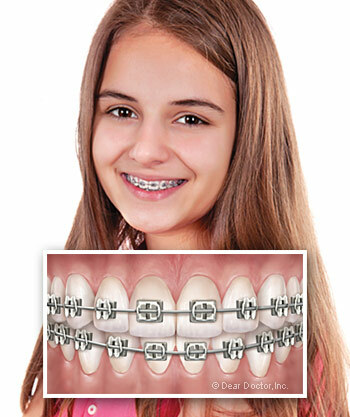 These traditional braces are made out of high-grade stainless steel and offer an economical, yet still incredibly efficient, orthodontic treatment. These braces are attached to a patient’s back molars with metal bands and then smaller brackets are cemented to the front of each individual tooth. A thin, metal archwire that’s custom-shaped to the patient’s mouth with run through these brackets and is attached with elastic bands in order to guide the teeth toward their optimal positions. While these traditional braces are smaller, lighter, and more comfortable than ever, they’re not as attractive as other types of braces. While ceramic braces may work the same as metal braces, there’s one clear difference between the two—ceramic braces use translucent brackets instead. This allows the braces to blend in with the natural color of your teeth. This treatment is a favorite amongst adults as they’re more discreet and allow a person to maintain a more professional appearance. The downside of this treatment though is that the brackets are more fragile than those found in metal braces and are more likely to break. Lingual braces work in a similar manner when compared to metal and ceramic braces, though they provide a treatment that’s essentially invisible to others. How do they do it? The braces are placed on the back of your teeth instead of the front! Despite their different placement, they actually offer the same reliability and power that metal braces can provide. However, this does create a few downsides as well. They’ll take longer to get used to, they can sometimes lengthen treatment time, and they’re more expensive as well. If you’re interested in any of our types of braces or our Invisalign treatment, we encourage you to schedule a visit with your orthodontist in Knoxville, Tennessee. To do so, you can give us a call at (865) 687-6560 or fill out our complimentary consultation form. We can’t wait to see you and provide you with the orthodontic treatment that’s best for you!